Here’s a fun clip! In December 2008 I wrote the script for this PreSonus holiday commercial spot featuring Randolph the Rockin’ Reindeer (Rudolph’s brother). On September 30, 2005, shortly after the death of electronic music pioneer Dr. Robert Moog, famed electronic musician Larry Fast, Cornell University professor Trevor Pinch, and I were interviewed on The Kojo Nnamdi Show, presented by American University’s NPR-affiliate station WAMU. 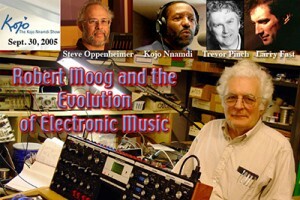 The topic: Robert Moog’s impact on the evolution of electronic music. Check out some of my classic EM features. Steve O’s EM editorials are online again! Copyright © 2015 White Dog Communications All Rights Reserved.